Don’t snicker at the name, but this is the Mitsubishi Engelberg Tourer – and it previews where Mitsubishi is taking its plug-in hybrid ambitions after achieving massive success with its Outlander PHEV. Any 1960s crooners should look away – the Engelberg Tourer has actually been named after a Swiss ski resort, perhaps in a bid to attract well-heeled customers. Still only a concept for now, the Engelberg Tourer uses a next-generation plug-in hybrid powertrain, which mates a 2.4-litre naturally-aspirated petrol engine to an electric motor on each axle. The car’s 20kWh battery pack allows it to travel for up to 44 miles on electricity alone, and the system’s full range is said to be more than 400 miles. Though few technical details have been given, it’s likely that the Engelberg Tourer’s powertrain follows the template set down by the Outlander PHEV. That would mean that the engine doesn’t directly power the wheels at low speeds, instead generating electricity to allow the electric motors to provide motion. Then, at higher speeds, a single-speed transmission would link the engine directly to the driveshaft, allowing for more efficient motorway cruising. The Engelberg Tourer’s styling is an evolution of the brand’s latest family ‘face’, seen on the recently updated ASX and L200 pickup. It comprises a large grille with stepped horizontal bars and cinched-in chrome elements at the sides – with the headlights placed separately and lower down the car’s front. Fun ‘lifestyle’ touches include a built-in roof-box, which opens and closes electronically and features LED foglamps along its front edge. Though the Engelberg Tourer is just a concept for now, elements of its styling and tech are likely to reach production. 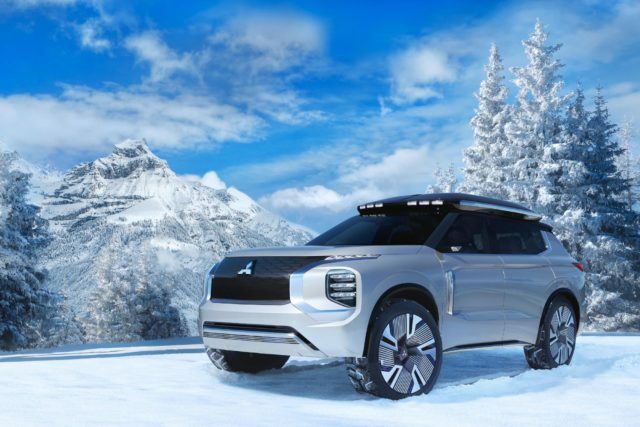 Alongside the Engelberg Tourer, Mitsubishi also previewed its vision for how it will be charged. The system, called the Dendo Drive House, uses a bi-directional charger which can either top up the car’s battery or use it as a power source in times of high demand or to sell it back to the National Grid. Solar panels and a large ‘home’ battery also fit in.